Bright colors have been in the fashion spotlight for a while now, and they are still going strong in one of this season’s hottest fall trends, high contrast color blocks. 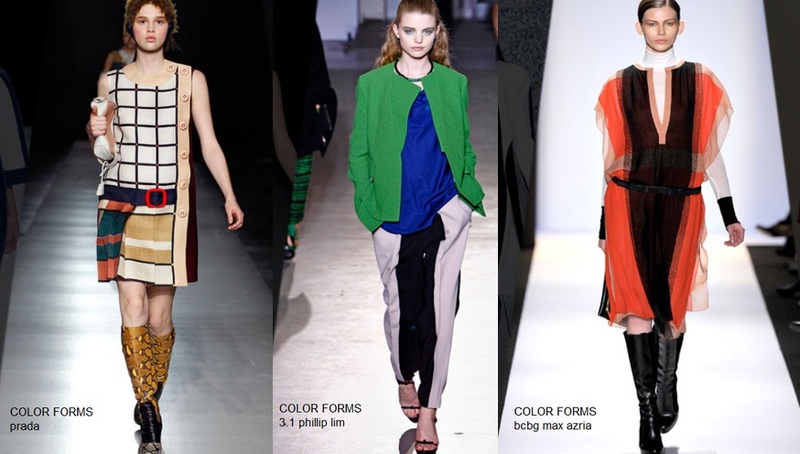 Designers mixed electric colors with geometric shapes for this graphic, eye-catching, fall fashion trend. From Mondrian’s plaid shifts to Balencia’s black and white tunic paired with ultraviolet trousers, this season’s runway look is all about color. This trend is a show-stopper – just remember not to go overboard with this look; color blocks are chic, but accidentally go too far with this trend and you can end up looking like a clown on his way to a birthday party. Choose one color block piece and pair it with a simple and classic solid garment. Try pairing a high contrast, black and white color block sweater with some skinny jeans or a classic solid blouse with color block trousers. Perhaps if you are feeling a little more daring, try a color block dress with some bright accessories, such as Prada’s geometric print dress paired with electric yellow boots (see below). Want to have an upper hand on everyone for this fall’s latest fashion trend? Alber Elbanz of Lanvin predicted the new fall collections would “take all these animal prints out of the jungle and into the city.” His predictions have come true; leopard print is taking over! From multi-textured furs to trendy new accessories, this new animal print is the staple of this fall season. 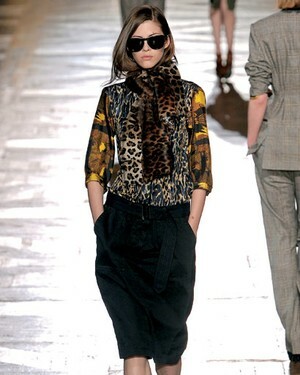 Remember, animal prints can be flawlessly chic or a fashion disaster depending on how they are worn. Limit yourself to one leopard print garment or accessory in your ensemble. Try pairing a leopard blouse with neutral pants, or add a fashionable animal print scarf or purse to jazz up your outfit. Denim leggings are one of the latest fashion trends! This skinny style of jean has made its way back from the 80’s and is definitely here to stay. Have no fear, denim leggings aren’t uncomfortable and constricting as some may think; these leggings actually have a great stretch, allowing for a close and comfortable fit. These denim leggings, or “jeggings,” as they are being labeled, are not your average teenagers’ leggings; they can be dressed up or down, worn casually or sported with a more sophisticated look. All this hype about denim leggings leaves only one question – how do you wear them? Have fun with you leggings, and don’t be afraid to try something new! A great look with skinny jeans is a button-down shirt paired with a belt cinched in at the smallest part of your waistline. These leggings also look chic paired with some ballet flats and one of this year’s hottest styles, the fitted women’s blazer. When searching for a top to go with your great denim find, remember it is important to keep your blouse slightly loose or layer another blouse or blazer over a tighter fitting top. Have fun with the new colors of jeggings as well. 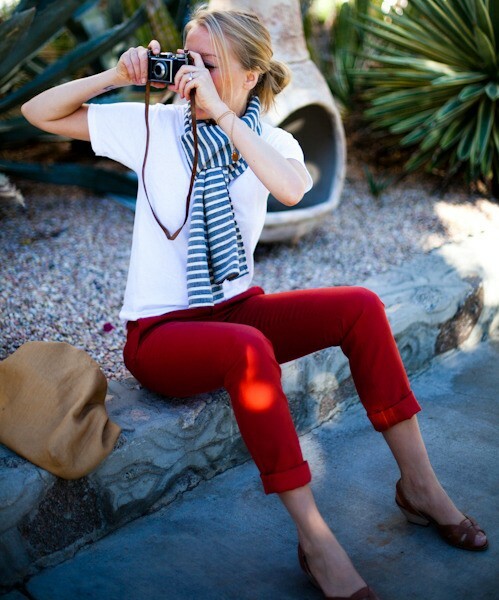 Keep your look avant-garde with some red jean leggings. However, when wearing bold legging colors, even things out by keeping the top more subtle, such as a simple black or neutral colored blouse. For a more sophisticated look, stick with the dark wash denim leggings, such as dark blue or even black. It is important to leave the destroyed denim packed with holes, faded washes and patterned jeans out of this look. For this more distinguished fashion approach, pair the leggings with a tunic. Tunics vary in length allowing one to choose the perfect top that falls just over their hips, creating the allusion of a longer torso. Then dress up the jeggings just as you would a pair of dress jeans. Try adding a fitted blazer over a long top, then pair this look with some stylish platform heels. Find denim leggings online at Hue, Gap, Old Navy and Dillard’s.